Road injuries are now the biggest killer of children and young adults worldwide, according to the World Health Organization (WHO). The organisation published figures that also reveal Africa has the worst rate of road traffic deaths in the world. Its report says many African and South American countries still do not have sufficient speed limit laws. But it also highlights that global road death rates relative to the size of the world’s population are stabilising. Car accidents are now the leading global cause of death amongst children and young adults aged five to 29 years old, the report says. It contends that says more people die from road-related injuries than from HIV/Aids, tuberculosis or diarrhoeal diseases. “These deaths are an unacceptable price to pay for mobility,” said Tedros Adhanom Ghebreyesus, the WHO’s director-general. 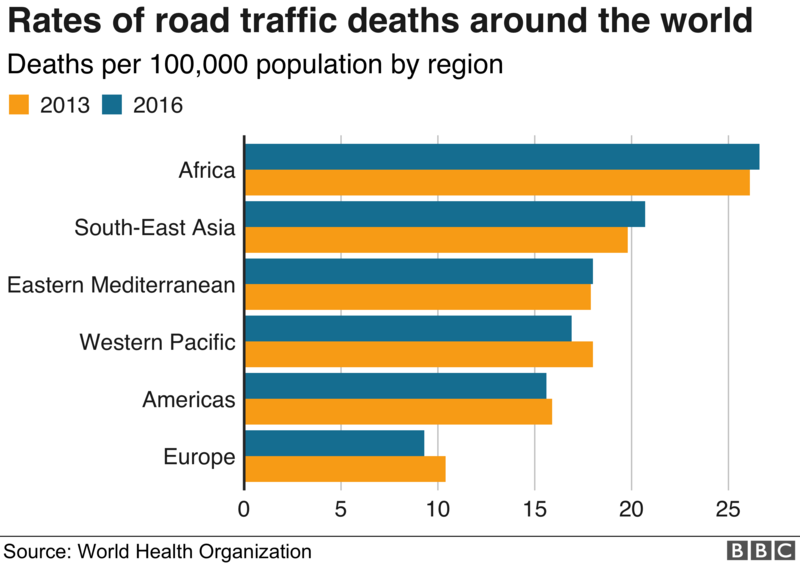 The WHO report says that at 26.6 deaths per 100,000 people, Africa’s road fatality rate is nearly three times that of Europe, which has the lowest globally. It says nearly half of the 54 countries in Africa have no speed laws or speed limits in place. Botswana, Ivory Coast and Cameroon have all seen death rates increase. Egypt, Angola, Burkina Faso and Burudi are among those that have seen a reduction. Africa also has the highest rate of pedestrian and cyclist mortality. According to the latest data, about 1.35 million people were killed in car accidents around the world in 2016, up slightly from previous years. The risk of road deaths is said to be three times higher in low-income countries. South-East Asia trails Africa as the second-most dangerous region, followed by the eastern Mediterranean. But despite an increase in the number of deaths, the WHO says the global death rate from road accidents has stabilised in recent years. The WHO attributes this to increased safety efforts in middle- and high-income countries. These include the development of safer infrastructure like cycling lanes, and “better” legislation on speeding, seat belts and vehicle standards. Europe, the Americas and the Western Pacific have all seen a drop in road traffic death rates.